OK, I'm trying to get caught up on everything. Or at least sort of... My mom and I have been busy plotting out the baby's room, and she's been doing some fabulous thrifting. Don't worry, my husband has plenty of input, too, and we aren't railroading over him on anything. He does like having a say in decorating things. He has strong opinions about style. Seriously. Fortunately, ours are usually in tune. Aside from the wonderful rocker that I'm still waiting on (the upholsterer has it, but I have no ETA for when I'll get it back. Does anyone have any suggestions about how long it usually takes to get a piece of furniture back?) these blankets are the base inspiration for the baby's room. They are from Target (duh) and I'm in love with the graphic patterns and the warm colors. And of course, gender neutral. Don't they look pretty together? The blanket on the bottom is a knit blanket. I'm thinking maybe it will be used on the rocking chair as a throw blanket, or maybe as a "stroller blanket." But I'd probably be too worried it would get dirty. Sigh. These receiving blankets are so neat. I love that pattern on the far right. I wish they were sheets or something more useful. Receiving blankets are great to have, but more from a utilitarian standpoint. They don't give tons of impact. The set is under $20, and it's very tempting to go get another set to have on hand "just in case..." Same with the knit blanket. That one is a little more, but I want to say it's maybe $16. Much much cheaper than the DwellStudio line that isn't associated with Target. Speaking of DwellStudio, this is the "dream set." It's around $350 on Amazon, which is just never ever going to be in our budget, but isn't it lovely? The similar line that is DwellStudio for Target is not nearly as cute. The stripes are different, and the dots are just regular dots, so it looks more girly and babyish. 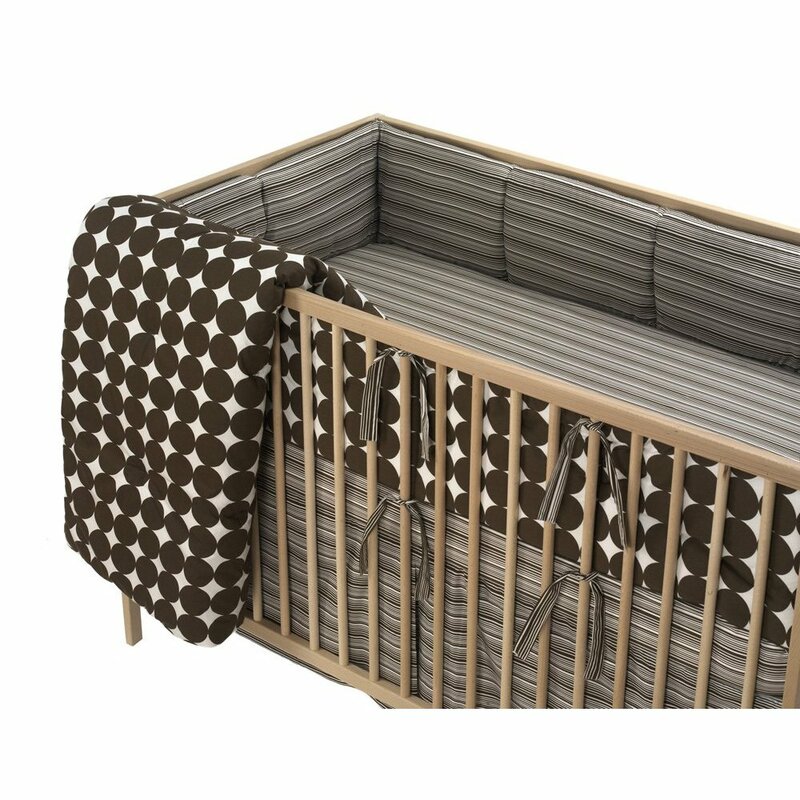 It's also about $300 cheaper... After finding the blanket sets at Target (the ones I bought and love) I found this set on Amazon and sent it to my mom in one of those "can you believe how cute this is?" e-mails. So brace yourself. Not too long after that, my mom found the comforter FROM THIS SET at Goodwill for $3. Yes. $3. Granted, it's only the comforter, not the bumper or crib skirt or sheet, but it's definitely from this fancy set. My dream set. It's the dotted comforter depicted above folded over the side. One side is the dots and the other side is the stripes. Isn't that the weirdest/awesomest/happiest coincidence? I think so. Here's a depressing and weirdly dark photo of the baby's room. Sorry. I don't know why it came out like this. I think my camera might be on its last leg. As you can see, the room is teensy. And full of junk. We are still in the process of clearing Roxanne's toys out of here and finding new homes for them. It's not an easy process... The wall on the left features the amazing chest my mom found at Goodwill. It came with the amazing dresser on the right! Better pictures below, I promise. I just wanted to show what the room sort of looks like now. The chest will be put in the closet (which is also on that left wall, but out of this shot). I measured the room, and that spot is the only place where the crib will fit. The dresser will stay where it is, and we plan to put the changing pad on it. It's looooong. And lovely. Here's the chest. If you can see it behind all of Roxanne's toys. See those legs? The laminate on both pieces needs a little TLC, so I'll need to brush up on my DIY tutorials and get them cleaned up at some point. But neither is that bad, and they are sturdy and solid pieces. Here's the dresser. The mirror is pulled over the left because we need to have room on the right side for the changing pad. And for the lamp collection... We're not going to keep all of them. We're just trying to decide which ones we should keep. Isn't this gorgeous though? From what I remember, the two pieces together cost around $115. Cheaper than the one IKEA dresser we were considering, and a zillion times more sturdy. My mom has a great eye. This is what the center knobs look like on the dresser. The set is by Bassett, as evidenced by the stamp inside the drawer of the dresser. The back of the set is marked "Pageant," so I was hoping I could find some information about this line somewhere on the interwebs, but nope. Either way, Bassett is a great company, and this furniture is fantastic. I'm hoping this stool will work with the rocker. I spotted it at Goodwill but talked myself out of buying it. My mom ended up going to my Goodwill the same day I found it to do me a favor and look at a daybed I was having second thoughts about not buying. I didn't end up getting it, but she helped me realize that this stool and the cute nursery lamp that I had her look at while she was there were worth buying. This stool was $8 and the lamp was around $5 I think. I originally planned to have this stool recovered in the extra fabric from the rocking chair, but then I realized we were using a lot of brown, and I decided to keep this fabric on the stool for now. It has a pretty deco charm. The one on the far right is one I just recently found at Goodwill. It was $8, and is a fakey kind of wood. I like it, but I think it's too much wood/wood-look in there. The one in the middle is my favorite. My mom found it at her Goodwill, and I think it was around $11. It's a lovely shiny lamp. And I like that it's a lighter brown. The nursery lamp on the far left is super super cute. But it's also kind of tiny on this dresser. And I'm not sure if the colors will be OK. Here's a close-up. Cute, right? It's a little broken, but I still think it's adorable as is. Sorry the image is blurred again. My camera and I are not big buddies at the moment. OK, that's all for now! We still have lots to figure out, like if we are going to paint (Justin wants to, but I still kind of love this wall color) and what will go on the walls. I'm really hoping the rocking chair gets done soon. I can't wait to see it all done! I love the chocolate brown color of your inspiration piece. Can't wait to see finished pics! There are lots of pictures of decorated baby nurseries on my website that you might be interested in. The ones that are entered in our baby nursery photo contest are so cool! If I remember correctly there are some decorated in a similar shade of brown as the one that you're considering. Love love love the Dwell studio geometric patterns! The dresser and chest are so fantastic. I can't wait to see the finished room. How exciting! Congrats on your upcoming little peanut. My hubby and I are trying for our first. MSBABY: Thanks for stopping by! Your website is great! Rhan: Thanks! Good luck to you and your husband! If I were you, I'd be keeping that furniture set you are wanting to sell! It's so cute for kids. :) Even boys!